(Phys.org) —Determining the mass of dark matter particles requires accounting for several factors, one of which is the velocity distribution of the particles. Most current estimates of dark matter mass involve assumptions regarding the velocity distribution, since this distribution involves a high degree of uncertainty. 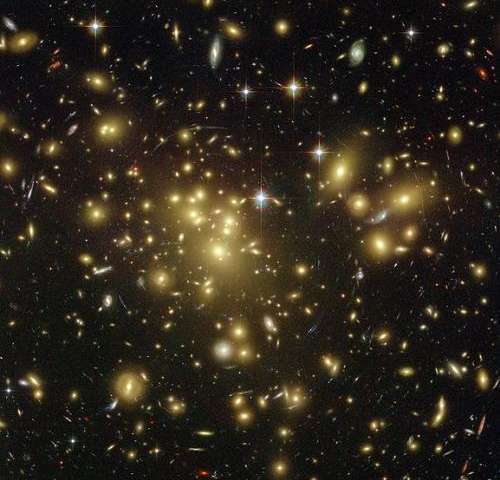 In a new paper, physicists have presented a model-independent method for determining the dark matter mass that doesn't require any assumptions about the velocity distribution, marking the first time that the dark matter mass can be accurately measured in an unbiased way. The physicists predict that this tool will be invaluable for the analysis of future experimental data. The scientists, Bradley J. Kavanagh and Anne M. Green at the University of Notthingham, have published their paper on the model-independent measurement of dark matter mass in a recent issue of Physical Review Letters. Although physicists don't know exactly what dark matter is, one promising candidate is weakly interacting massive particles (WIMPs). Scientists can detect WIMPs in the lab, both directly and indirectly through their annihilation products. In one type of direct detection experiment, scientists can measure the nuclear recoils produced by WIMPs when they interact with atomic nuclei, and this data can provide a way to measure the WIMP mass. In order to extract the mass data, however, scientists must make assumptions about the velocity distribution of the dark matter particles within the Milky Way halo. This velocity distribution encodes the speeds of the dark matter particles and determines the recoil energies observed in experiments. Usually, scientists use the simplest model of the Milky Way halo, called the standard halo model, to make assumptions about the velocity distribution. But as the physicists point out, some recent simulations suggest that this model is incorrect. For one thing, the standard halo model does not account for the effect of baryons, which is not fully understood. The differences can lead to uncertainties in the velocity distribution that cause significant bias in measurements of the WIMP mass. Although several different approaches have been proposed to account for this uncertainty, they all still have significant shortcomings, and some of them make other assumptions. Here, the physicists have presented an approach that allows the WIMP mass to be measured without any prior assumptions, using only data that will be available soon from upcoming experiments. To demonstrate the approach, the physicists generated three mock data sets and used them to reconstruct the WIMP mass in different scenarios. They showed that, although the method does lead to an unavoidable uncertainty in the cross section (a factor that involves particle interaction), it can still accurately recover the WIMP mass. "Prior to this work, it has been necessary to make at least some assumptions about the velocity distribution in order to extract information on the dark matter mass," Kavanagh told Phys.org. "However, with no way of knowing how accurate these assumptions are, we would have no way of knowing whether the dark matter mass we extract is correct. We have shown for the first time that in a variety of scenarios, we can analyze data without making such assumptions and therefore that the dark matter mass can be recovered reliably from direct detection experiments. As the physicists explain, this ability to measure the WIMP mass without making assumptions of the velocity distribution will be very useful when analyzing data from many other dark matter experiments. "Dark matter cannot be accounted for by any of the known particles in the Standard Model of particle physics," Kavanagh said. "This means that dark matter must be in the form of a new species of particle, governed by new physics beyond the Standard Model. Knowing the dark matter particle's mass can give us an insight into this new physics, for example allowing us to rule out theories which do not predict the correct value. "At present, no confirmed dark matter signal has been observed in any direct detection experiments. This allows us to place bounds on how weakly dark matter particles interact with ordinary nuclei. However, with larger detectors and longer exposure times, we can probe weaker and weaker interactions and it is hoped that a signal will be observed sometime in the near future at current and upcoming detectors. Once this happens, our method will allow us to combine data from several direct detection experiments in order to reliably extract both the dark matter mass and velocity distribution." In the future, the physicists plan to further text and extend their method, and are hoping to see a dark matter signal in the near future. "We are currently working on testing the method using even more mock data sets, representing a wider variety of underlying velocity distributions and WIMP masses," Kavanagh said. "We also hope to extend the method to the analysis of directional data. Directional detectors measure both the energy and direction of nuclear recoils and therefore allow us to probe the full three-dimensional velocity distribution, rather than the one-dimensional speed distribution. This in turn will allow us to probe the dynamics of the Milky Way halo using directional experiments. "Unfortunately, we do not know how strongly (or weakly) dark matter interacts with ordinary nuclei, so we do not know when a WIMP signal will be observed. With the advent of ton-scale detectors in the next few years, we should be able to test dark matter interactions 100 times weaker that what can currently be probed. If we're lucky, this means we could see a dark matter signal within the next few years." What's next for particle physicists, post-Higgs? This gentleman, A.B. Kukushkin, doesn't seem to think DM is necessary. He proposes a role for plasma produced nanodust or nanotubes which produces an electrodynamic "baryonic cold skeleton" to describe the seeming connectedness of galactic disks and other such gravitational "anomalies". "Dark matter cannot be accounted for by any of the known particles in the Standard Model of particle physics," Kavanagh said. "This means that dark matter must be in the form of a new species of particle, governed by new physics beyond the Standard Model. ……. Maybe the new physics is that dark matter is the manifest of Higgs field which is the same thing as vacuum energy which pervades all vacuum space…. In the case of Dark Matter, the premise on which it is based is flawed. The theory follows the path determined by red shift readings, for which the presumed cause is erroneous, because not enough information is factored into those readings, such as the photonic energy losses incurred when transmitting over those vast distances. The copper wire medium is known to incur losses when transmitting electricity a long way. So too with the medium of space, where it concerns photonic wavelengths. This phenomenon might be construed as acceleration of the energy source object away from the point of observation. This explains why the Universe appears to behave the same way no matter where from within it you observe it. Yet again a whole article without one solid fact on which to base it. Nothing has been found, all these theories are simply dreamt up. The supposed existence of Dark Matter is entirely based on the consequences of the "law" of gravity which is demonstrated to be false by a relatively simple experiment. Frankly I am tired of recounting encyclopedic knowledge about the universe on science sites. It isn't arguable, one can look up the facts oneself! Say, in the Wikipedia article. @cantdrive, baudrunner, Reg Mundy: DM (and DE) are non-controversial facts of the CMB universe. You can see the universe energy content and the different ratios by looking at the acoustic peaks in one simple observation. And no other cosmology can reproduce that figure except big bang+DM+DE! People have tried, and failed. @Franklins: The elephant in the room is that the first cosmological bound puts WIMP DM to > 40 GeV. So those observations won't predict the bulk of the observed DM either way. But yes, combining the above bound (from 2011, IIRC, by two independent means) with the XENON100 result means the search for DM is more constrained than what the latest hullaballoo is claiming. The whole point is, DM and DE are NOT FACTS! Where is the evidence? "Scientists can detect WIMPs in the lab, both directly and indirectly through their annihilation products. In one type of direct detection experiment, scientists can measure the nuclear recoils produced by WIMPs when they interact with atomic nuclei, and this data can provide a way to measure the WIMP mass." The proportionality of the degree of influence of gravity as it relates to the distance between two objects in space is analogous to the energy of photonic wavelengths as they relate to the distance from the emitter to the observer. And they call that resulting red shift of the photonic wavelength proof that the emitter is accelerating away from the observer. That is the foundation of Dark Matter Theory, invented first to accommodate that apparent acceleration. It started out on a false assumption.